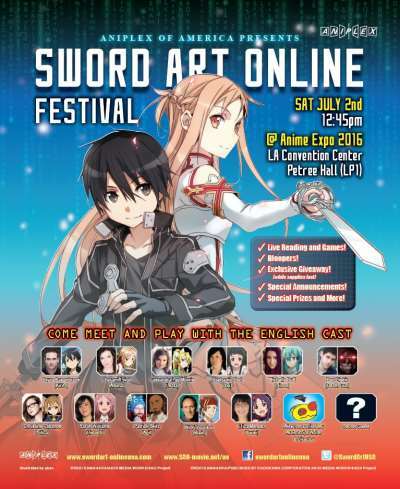 (By Staff Reports)– Aniplex of America is proud to announce that they will be hosting the Sword Art Online Festival at this year’s Anime Expo to celebrate the worldwide release of Sword Art Online The Movie -Ordinal Scale- in 2017.
dub cast from the series including: Bryce Papenbrook (Kirito), Cherami Leigh (Asuna), Cassandra Lee Morris (Leafa), Stephanie Sheh (Yui), Michelle Ruff (Sinon), Ben Diskin (Death Gun), Christine Cabanos (Silica), Sarah Williams (Lisbeth), Patrick Seitz (Agil), Kirk Thornton (Klein) and Erica Mendez (Yuuki) along with Alex von David (ADR Script Writer/Director) as the MC. Aniplex of America has also confirmed that they will be welcoming some secret guests who will only be revealed at the event. Similar to last year’s KILL la KILL English Cast Panel hosted by Aniplex of America, Sword Art Online Festival will feature a wide variety of live entertainment by the cast members, such as live line readings, games, and bloopers. Fans who attend the event will also receive an exclusive giveaway item while supplies last. Details of the giveaway item will be announced at a later date. Aniplex of America also plans to make a special announcement regarding Sword Art Online The Movie -Ordinal Scale- at this event. In 2022, the world of virtual reality was turned upside-down by the emergence of a new invention called NerveGear created by the genius programmer Akihiko Kayaba. For the first time ever, NerveGear realized the full-dive functionality and with it, came endless possibilities for VRMMORPGs. In 2026, a new device called Augma was created to compete against NerveGear and its successor, Amusphere. Augma is a next-gen wearable device that omits the full-dive functionality possessed by its predecessors. Aniplex of America Inc. (Santa Monica, California) is a subsidiary of Aniplex Inc. (headquartered in Tokyo, Japan) – a Sony Music Entertainment (Japan) group. Aniplex Inc. is the leading provider of anime contents, along with music production and distribution in Japan. Aniplex of America has launched fan-favorite Blu-ray and DVD titles including the Sword Art Online series, Your lie in April, KILL la KILL, Bakemonogatari, Fate/Zero, Puella Magi Madoka Magica, Blue Exorcist, NISEKOI, OREIMO 2, Magi: The Kingdom of Magic, Expelled From Paradise, The irregular at magic high school, ALDNOAH.ZERO, Fate/stay night [Unlimited Blade Works] and DURARARA!!×2. The company’s ever-growing line-up of shows includes our most recent titles such as: ERASED, The Asterisk War, OWARIMONOGATARI, Charlotte, Classroom Crisis, WAGNARIA! !3, GOD EATER and HAIFURI (High School Fleet). entertainment, music, fashion, and video games. For more information, visit www.anime-expo.org. professionals and fans. For more information, please visit www.spja.org. Previous Last Chance to Pre-order Power-Con Passes Online!